The life of a poker pro is typically filled with numerous ups and downs, and perhaps nobody exemplifies this better than the man who hoisted the Chip Reese Memorial Trophy at the 2010 World Series of Poker yesterday: Mike Mizrachi. “The Grinder” as he is known in poker circles burst onto the poker scene with a series of wins, and made millions at the poker tables over the last half-decade or so. Unfortunately, a few bad investments, poor management, and perhaps selling off to much of his action in tournaments left Mizrachi in tax trouble, and saw two of his properties foreclosed upon –basically after the housing collapse the homes had lost too much value and Mizrachi decided it best to just walk away from them. Throughout the ordeal Mizrachi stayed positive publicly knowing that his poker skills were second to none, and he proved this on Tuesday by winning the second most coveted championship at the WSOP: The $50,000 Players Championship. 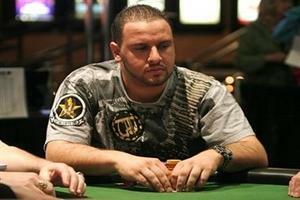 The win netted Mizrachi over $1.5 million in addition to his first WSOP bracelet. Mizrachi captured the title after rivering a long-shot flush against Vladimir Schmelev: The two players were all-in pre-flop with Schmelev holding A-J to Mizrachi’s A-7. Mike’s triplet brother Robert finished in 5th place in the tournament as well, taking home $341k. This entry was posted on Wednesday, June 2nd, 2010 at 10:24 am and is filed under Poker News. You can follow any responses to this entry through the RSS 2.0 feed. You can leave a response, or trackback from your own site.